This Cheesy Zucchini Gratin will be a hit every time with family and friends. We combine the nutty flavors of fontina and parmesan to layer the zucchini and give you a delicious bite every time. Feel free to use any cheese you have on hand, but I think we nailed it with this combination! What Makes Zucchini One Of The Best Vegetables? Not only is zucchini used in its whole form like it is in this recipe, but it is often used in baked goods from muffins to brownies. When using it in baked goods it is best to grate it up finely. This creates the end result of a moist baked good without giving off any of it's flavor. Since zucchini isn't overpowering to begin with it can be used and hidden in foods that you would least expect! We have an amazing muffin recipe coming out soon that I just created last weekend so be on the look out. Zucchini can be the star of any dish, especially when spiralized and used to replace pasta, but in my opinion it makes for the best side dishes. Another great low carb side dish we have using zucchini is our Zucchini﻿﻿ Fries. They are the perfect pairing to burgers and sandwiches and great for snacking any time of day! You can also use it in stir fry, casseroles and as chips. I personally use zucchini almost everyday for dipping. I miss chips and dip so much that I always find myself making dips without having a proper dipper. But, I recently discovered that zucchini is my favorite replacement! Aside from using it as a chip, you can also make our Zucchini Keto Lasagna, which replaces the noodles with thin strips of zucchini. I always seem to have zucchini in the fridge so if you're the same way give this cheesy zucchini gratin a try for dinner tonight! 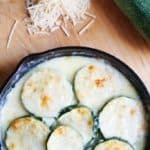 Recipe can be quickly added to MyFitnessPal - Search "KetoConnect - Zucchini Gratin"
Slice zucchini into rounds and set aside, and shred cheese if not pre-shredded and set aside. In a medium heat sauce pan add butter and garlic and cook until fragrant. Add the heavy whipping cream and combine. Slowly add the fontina cheese allowing it to melt before adding more and continuously stirring. Add half the parmesan to the sauce pan and continue to stir. Add the xanthan gum, season with salt and pepper and stir for additional 2 minutes as the sauce thickens. TIP: For the dish we used our 6 inch skillet. Layer some of the fontina cheese mixture into the bottom of the skillet and make a layer of zucchini on top. Sprinkle with some cheese and season with salt and pepper. Repeat the process until all the fontina mixture, zucchini and parmesan is used ensuring to save some parmesan to sprinkle on the top before place in the oven. Bake at 375 until the cheese is golden brown on top, about 22-25 minutes.